Acquiring futuristic killing tools and bulky armour that makes you look a wee bit like a robot is one of the ways future soldier sorts will be progressing through Call of Duty: Advanced Warfare’s multiplayer modes. What’s the point of going to war unless there’s loot at the end? 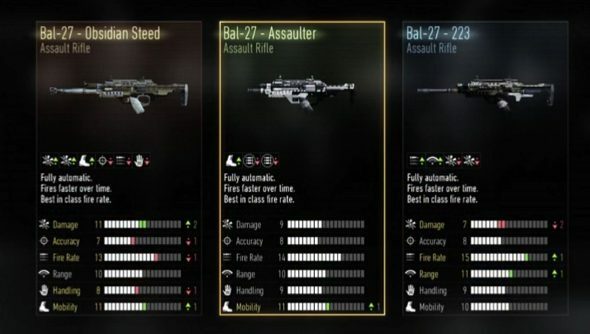 Direct your eyes below, where Sledgehammer Games’ Michael Condrey gives up the skinny on the shooters supply drop system. 1,000 items sounds like a nice, high number. Supply drops are one of two ways players can progress through the multiplayer, the other being XP, which Condrey says is going to be what returning players are used to. The gear gained from drops are split into different types of items, like weapons (and variants on base weapons) and boring stuff like shirts, or significantly more exciting things like exoskeletons and snazzy sunglasses. Items come in different rarities, too, like they would were this an MMO or an RPG. Sledgehammer only revealed Advanced Warfare’s multiplayer a wee while ago, and it does sound there’s been a lot of changes, hopefully for the better. Jetpacks do improve most things.